Are you wondering about the alphabet? The letters are made with the Big Shot and the Serif die cuts. Nifty huh? If you are in a Christmas shopping mood, no problem. You may shop at my online store 24/7. Thank you visiting. Take care and God bless. Another sweetly serene Christmas creation, Gloria! LOVE the color combination...perfect for that set. You'll have to post a comment to be connected to the group page and get updates by email. Oh I love this!! What a great idea to use an ornament for the 'O' in JOY. The embossed envelope is sooo cool, will have to try that out! Thank you Kristie for visiting my blog. I'm happy you enjoyed the Joy card. I'm coming over to visit your blog. 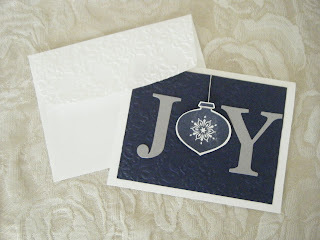 Gloria, this is another beautiful Christmas card...I love the embossed envelope flap too, what a great idea!! Beautiful card! I love the simple and elegant look to this card. What a lovely Christmas card. I really like the Night of Navy and Brushed Silver together. Thank you Paige for your nice comment. I'll be over to SCS pretty soon to our page. Thank you Donna for your nice comment. See you over at SCS on our page. Love this card! This idea might be a front runner for christmas classes! Thanks for stopping by my blog! You are more than welcome to CASE the card you liked. I am already a follower of you blog from SC. I just haven't commented on everyones yet. Love the embossed envelope to go with the above card. Good idea!